Get Rid Of Pigeons And Pigeon Mess: They Could Kill You. A bad news week this week following the sad deaths of two patients at a Scottish hospital due to a disease that they caught from pigeons at the hospital. Pigeons are ridden with diseases that affect the gut and lungs and are harmful or fatal to humans and this isn’t the first time such deaths have been reported, such as this case. You don’t need to actually touch a pigeon to catch the diseases, just touch things they’ve contaminated or breathe in air that’s been around them. And it isn’t just nasty gut and lung diseases that they can pass on to us. The birds have a lot of insects living on them and in their mess and droppings. 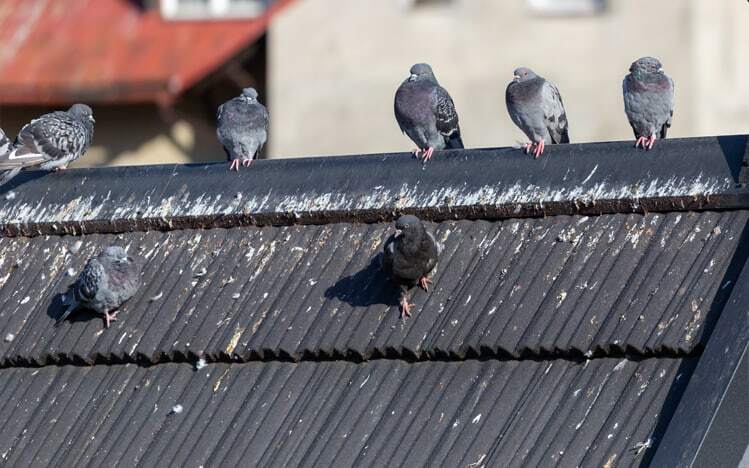 Pigeons in the attic can infest a house with bird fleas and bird mites that will bite you to feed on your blood, and moths, beetles and flies breed in their mess and can infest buildings. Pigeons live in and on roofs too, and pigeons live under solar panels. Their mess and debris weakens roofs, blocks gutters and downpipes and can cause structural damage. These are all very good reasons to get rid of pigeons and pigeon mess and use bird control for pigeons. We’ve used bird control to get rid of pigeons in attics and lofts, pigeons on shop signs, pigeons on gutters, pigeons on roofs, pigeons in roofs, pigeons on fire escapes, pigeons on balconies, pigeons in yards and pigeons in buildings. We use solar panel bird proofing to stop the birds nesting under solar panels too. They are so well adapted to living in towns and cities that they get everywhere! We are very experienced in bird control and pigeon control and use a wide range of methods to get rid of pigeons and pigeon mess: bird-proofing, such as pigeon spiking, netting and bird gel, to get rid of pigeons: shooting; cage-trapping: mess and nest removal: clearance of pigeon mess and pigeons: bird proofing solar panels; laser control. If you have a problem with pigeons and would like advice or a survey then please contact us – we are always happy to help!